Looking for Halloween party ideas? These 19 witch recipes and crafts are perfect for your Halloween bash or to enjoy at home with your family. When you think about Halloween, things like skeletons, monsters, and, of course, witches come to mind. Witches are a common choice of Halloween costume and are found on Halloween decorations all over. 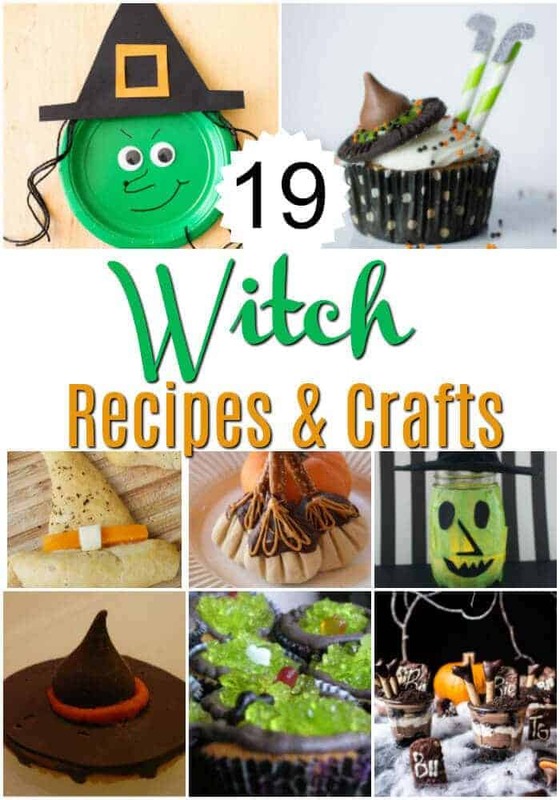 Below we have gathered a list of 19 terrific witch themed crafts and recipes from bloggers all over the web. From a paper plate witch craft for kids to witch slap bracelet corsages, there is a witch themed craft perfect for every member of the family. These witch crafts are also great for teachers to make with the little ones at school. Throwing a Halloween party this year? These witch recipes are certain to cast a spell on your guests! Delicious chocolate graveyard cakes, witches brew, and witch hat cookies are among the tasty and bewitching treats included below. No matter which recipe you decide to make, it is sure to be a hit. So go ahead and get crafting and baking, and make this year's Halloween the best one yet! Which of these awesome witch recipes and crafts will you be making this year? this is amazing. witches are my favorite. thanks! Very cute recipes. Thanks for sharing this list. These are all so much fun!